What we have all known by the above title is a Church of Christ, an organization of a people of common faith which aims at the elevation of all who may come within the radius of its influence. When we undertake to write a biography of a life, or a history of an organization of men, we must deal with the beginning and with the life. This community was settled sparsely in the early years of 1800 by men who came to Indiana Territory hoping to better their condition. After some years of struggling with the Indians and wild animals, the colony had grown sufficiently to feel the need of a common center. A few sturdy pioneers having come from the Virginias, the Carolinas, Kentucky and Tennessee, who worshipped God in the communities they had left, who had the love of God in their souls and desired to bring their children up in the 'Nurture and Admonition of the Lord' decided they must have a place of worship. The log house built for a church was placed almost on the same ground we now occupy. Why we do not know. We do know that John Lattimore and family, Walter Carson and family, James Mitchel and wife, and Thomas Graham and family, lived near this place. Under date of August 29, 1818, the record says: "The following persons were received by certificate: Thomas Graham and wife Polly, George Thompson and wife Nancy Thompson;; the following by examination: Chapman Denslow, Elisha Thompson and wife Hannah Thompson, and Alanson Andrews." Thus we see that the church numbered 15 souls. Of the struggles and sacrifices which may have been the portion of this devout band of men and women, we know nothing as we have no date until May 7, 1832, and then only the sessional minutes. It has always been our understanding that John Lattimore and Thomas Graham were the first elders of the church. A petition was presented at the meeting of the Presbytery in the fall of 1832, and the church ordered divided. The members who lived south of Bear Creek were constituted a new church at Paris, Indiana. All who lived North of Bear Creek were to and did remain members "at the Graham Meeting House." John Lattimore, George McCaslin, and James Miller were the ruling elders or spiritual advisors. Thus much for the organization and reorganization, or, more correctly, the division of the church. Sessional record, page 46: "Resolved that the session approve the action of the Presbytery in attaching the Paris Church to this, and the names enrolled" Thus the Watsons, Shilladays, and Grahams were again members of the Graham Church. This was the year 1842. If we refer to our minutes we find that the early church believed in prayer. Page 28, May 24, 1833, 2:00 O'clock: "The Congregation assembled engaged in prayer for the presence and blessed influences of the Holy Spirit upon the approaching communion season of which this is the commencement". Another thing we find they of that day had time for a three or four days meeting. It also seems that members were received or dismissed every preaching service. The ministers were: Nathan B. Derrow, organizer; Rev. John U. Parsons, 1832, assisted by Rev. Mr. Grey; John F. Crowe, and Dr. Blythe. In 1833 and 1834 Dr. Blythe assisted by Rev. Cunningham and Daniel Lattimore; 1835 Rev. G.B. Bishop and Rev. Wm. Bell. In 1836 Rev. Daniel Lattimore, son of Elder John Lattimore, was called to serve the chruch, and while others assisted in the work. Rev. Mr. Dunning in 1848, Rev J.M. Stone in 1854, Rev. John B. Sage in 1855. Daniel Lattimore seems to have held sway here almost 20 years. It was during his ministry that the present building was erected. Yearly report of April 1850 shows that during the past year $896.60 was received for all purpose. (Sessional minutes, page 61). On the 18th of September 1851, James H. Goodnow receipted Walter Carson $784.67 for building a chruch for the Presbyterian Church of Graham. Graham Church has been no exception to the rule, but has had her dark hours. Such a time was 1863 to 1868, at which time her membership was depleted; only one elder John Lattimore; no regular preacher; not able to support a pastor of its own, and the question was passed around 'what is to become of the church'. Yet there remained a few faithful ones who continued working and praying. In the spring of 1868 arrangements were made for services. Rev. J.Q. McKeehan and C.K. Thompson conducted a series of meeting and were assisted by Rev. D.D. McKee, during which there was an awakening and many came into the church. 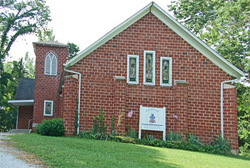 It was during the years 1868 and 1869 that several came from the United Presbyterian church class at Moffat School House, so that the Giboney, Simpsons, tweedys, and a number of the other families were enlisted in the work of the church. New officers were elected to fill vacancies caused by death and removal: William A. Graham, William Henry Carson and Thomas Giboney as ruling elders; James S. Carson and Levi Redman as deacons; John O. Lattimore, Thomas Graham, Joseph Miller and Robert Tweedy as trustees. This was done in the spring of 1869. It was not long until William G. Simpson was added to the eldership, and it may be here said that when elected to this office in this church they were expected to serve for life, unless they moved out of the bounds of the chruch. It was along about this time that the Madison Presbyterian met in this church. We can give an account of each year's doings, but pass on through the years in which the church had the services of Mas. m. McCrea and James Clark Burt, to the year 1881 when the church was visited by Evangelist Walter O. Lattimore, a grandson of Elder John Lattimore, and while conditions seemed unfavorable, the people were ready to do their part and went through rain and mud, and by the blessing of God many were added to the church, most of whom were young people; many of them devout workers today, some preachers of the gospel. Passing over the years to 1902, years of earnest effort by many, but years in which many discouragements were present. Yet they who were in the church believed in the preseverance of the Saints. Among those who should be mentioned are: Simpsons, Grahams, Carsons, Lauders, Jameses, Pearces and Hesses. As a result of such faithfulness in 1903 the church was repaired and the belfry added and otherwise improved, which was followed by several precious years in which the members were encouraged and many added under the ministry of J.H. Weaver and Daniel Simpson, assisted by evangelists, for the past five years the church has had several as stated supply, and now has Rev. H.M. Rogers. In the 100 years 26 ministers have served the church. Organizations are measured by what they are, what they have been, or the objects aimed at. And since organizations are made up of men and women, we can not expect more of such organizations than the lives of the men and women who compose it will warrant; and since the men and women into whose lives we have been looking have been a people of God, in whom God's love dwelt, who had by consecrating themselves to His and their lives to his services been brought under the leading influences of the Holy spirit and kept in the straight and narrow path, so amidst all the hardships, disappointments or discouragements the church never once gave up. So amidst all of the vicissitudes of the hundred years which have come and gone this church has been a meeting place where spiritual strength might be renewed; a place where the young have been instructed in the ways of righteousness by the twenty-six ministers who have labored here; and an organization through which possibly 500 souls have passed in their life journey from the cradle to the grave or from earth to heaven, where perhaps several times that number has paused to hear about God and their souls' salvation; an organization in which so many young men and women received instruction enabling them to form a Christian Character, and enabling them to be valiant soldiers in the army of the Lord. Nor yet is that all; A dozen ministers of the gospel have been proud to point to Old Graham Church as a place dear to their hearts because of instructions received or because of having descended from families who belonged here. Among these we may mention: Rev. Daniel Lattimore, whose labors were largely in Jennings County; Rev. Samuel Lattimore, who went to the south and became a Baptist preacher; Rev. John Q. McKeehan; Rev. David W. Moffatt, who served a long pastorate in the 1st Church of Fort Wayne; Rev. E.S. Miller, whose ancestors were here, although Hopewell Presbytery of Johnson County claims him as a son; Rev. George Giboney; Thomas J. Giboney; Rev. William Lattimore now of Lewiston, Idaho; Rev. Ezra Giboney, Seattle, Washington; Rev. Daniel Simpson, who served here for eight years 1904 to 1912, now of Gilman, Illinois; Rev. Charles Bernheisel, now a missionary in Korea; Rev. David McCaslin. Six of the above have answered the summons 'Come up higher'. Four of the ministers named above are descendants of Elder John Lattimore: two sons, one grandson, one great-grandson. Thus, if judged by the objects aimed at as before stated, viz., a meeting place for spiritual refreshment, for the spread of the gospel of Christ to the end that the young might be brought up in the fear of God, must we not say it has been all it was aimed to be? If judged by what it has been or by the influences set in motion, who of us can say it has not been worth while? None of us are old enough to know of the 1st ministers who have already been named, but many of us can remember some who followed, and as we recall the work they loved, in which list belong Rev. C. Lee, J. Mitchell, James Gilchrist, and S.E. Barr, we say "worthwhile" if judged by what it is with membership of Simpsons, headed with Mrs. Damsel Lattimore Simpson, a grand daughter of the Elder John Lattimore, daughter of Elder John O. Lattimore who is today the oldest member of the church, having joined the church Oct. 2, 1851; Next the Grahams, some of whom have been helpers in this church since its organization, while most of the family moved to Johnson County and helped or were instrumental in the organization of Shilo, Bethany, Hopewell and Franklin Presbyterian churches; Elbridge G. Graham, great grandson of Elder Thomas Graham, is here with his family to help in the work; next the Carsons who have been represented in the working force of the church since 1835. Associated with the above named we have members of the following names: Lauder, Perry, Ferguson, Palmer, Moorehead, Hansel, Davis, Pfeiffer, and others; with but one elder on the ground, John O. Simpson, great grandson of Elder John Lattimore; the other elder, David M. Carson, now in Columbus, Ohio. 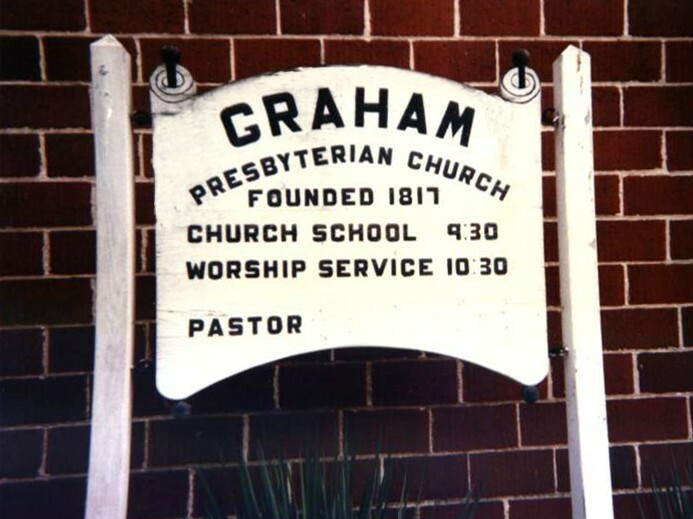 Is Graham Presbyterian Church a failure because her members are few who are in the field ready to answer to the call each time? Is it a time to laud all who have gone before and because we are few give up in dispair? A voice answers no, a thousand no. 'Despise not the day of small things' nor 'Judge the Lord by feeble sense but trust Him for His grace.' Let us think of the little band of seventeen of 1817 who worshipped here in the woods; of the twenty-five of 1818; of the thirty three of 1832; and the discouraged band of 1863 to 1868, when she only had one elder alive,- and meditate that only eternity can reveal all that has been accomplished through the instrumentality of the old church under the blessing of Almighty God; and remember shas a half dozen sons yet preaching the gospel; and if then faint hearted, visit the little silent city where rest the remains of the men and women dear to many here today, and pray God that a double portion of their mantle of love and devotion to God and Old Graham Church may fall upon us well as the present members of the Graham Church of today, to help by prayers as in former years. The Graham Church of long ago has been transplanted, not on Graham's fork but in the Eternal Mansions of Glory by the river of life. The Fathers, where are they? If the roll were called and the elders who have served in the past century could speak to this church, would they say, 'Give up' Nay, verily they were not the weak kind. Only one question remains to be answered concerning the continuance of the organization, 'Are the people willing to pay the price?' The same building stands, the same organization exists, the same triune God rules. Some of the members of the present organization are descendants of its founders; have they the faith, courage and determination, the same reverential fear of God to inspire their helpers to heroic self sacrificing service? If so, the work will continue, and Graham Presbyterian chuch will be heard from in coming days. This may certify all whom it may concern, that on Lord's Day, August 10th,1817, agreeably to previous consultation and mutual agreement a Church of Christ was planted on Fork in Jennings County, State of Indiana, when seventeen persons hereafter named, came forward in the midst of a respectable congregation and by entering into covenant and adopting a confession of faith where declared a Church of Christ, entitled to all the priviledges of Christ's house and the seals of the Everlasting Covenant. By order of the Presbytery upon petition of members of this church at their fall session 1832, it is divided, and those members situated south of Bear Creek, are constituted into a new church. The com. of presbytery appointed to examine these records, reported great omissions and irregularities thereupon the presbytery resolve that the session be directed to make out the best history they can of their proceedings and to be more particular in future. At a meeting of the Graham Church according to previous notice, Dr. Matthews presiding, the church entered into an election for pastor of the church. Whereupon it appeared that Mr. Daniel Lattimore, a licentiate of Madison Presbytery was unamimously elected to said office. A call being made out it was voted that the session subscribe said call. The following transcribed by by Sheila Kell, on 3/25/2012, from microfilm of the original minutes, at Jennings County Public Library. Session met Present Per Mr. Parsons, Moderator, brs. Thoms Graham, Saml Graham, Geo. McCaslin & James Miller; Examined the following charges. 1. Br James McCartney presented for intemperance, Confessed the truth of one charge of others there could be no Doubt. Thereupon the Session after laboring to Dissuade him from the use of spirits entirely, in main Voted, that, as Mr McCartney has often been arraigned for this breach of christian & moral Duty & still seems unable to resist the temptation while he continues to Drink in any quantity, He be debarred from the communionof the church till he gives satisfactory evidence to the Session that he has determined to dispense entirely with the use of spiriteous liquors. 3. Brother Geo McCaslon and Saml Dixon were summoned before the Session for unchristian conduct and feeling toward one another arising from a difficulty of long standing when the parties agreed to proceed immediately to trial Expression alleged by S. Dixon "the time is not far distant when all who do not join a Temperance Society our children will look down upon theirs with contempt or rather with pity" Brother McCaslon has no recollection of making this remark and disclaims feelings which it implies. Judge Finnacle was called & testified that he heard the expression made & he thinks by Mr McCaslin. Does not recollect any thing said which induced the remark. Thinks there was something said to this effect, that "The object of the The Effort was not to reclaim drunkards but to guard the young." Does not recollect that S. Dixon used the Expression in form of a question. Saml Shillideay testified that he heard Mr. McCaslin make the remark,leaning against the counter. - Discovered nothing like anger or resentment, understood him to mean that he believed the friends of temperance would sometime look down on those who continued to drink with contempt. Ephraim Shillideay-"Man was paying with a jugg & McCaslin said. "I look forward to the time when our children will look down upon yours with contempt." Patrick Dixon said "I don't like this contempt." Geo replied "rather with pity." Thinks the remark did not have reference to the man with a jugg. John Dixon I met Mr. McCaslin sometime afterward & we agreed in all but contempt. In view of this testimony this Session formed the following opinion. "We think the expression alleged, was probably used by Br. McCaslin & was an injudicious one. But, we consider it no matter of discipline & unworthy of serious regard & all the Difficulty which has sprung from it, as arising from Missunderstanding & prejudice. We feel therefore that these brethern have no just cause of Difference & exhort them to lay aside all hardness & bring oblivian all that is past & strive only to outlive each other in ardor of brotherly love & devotion. 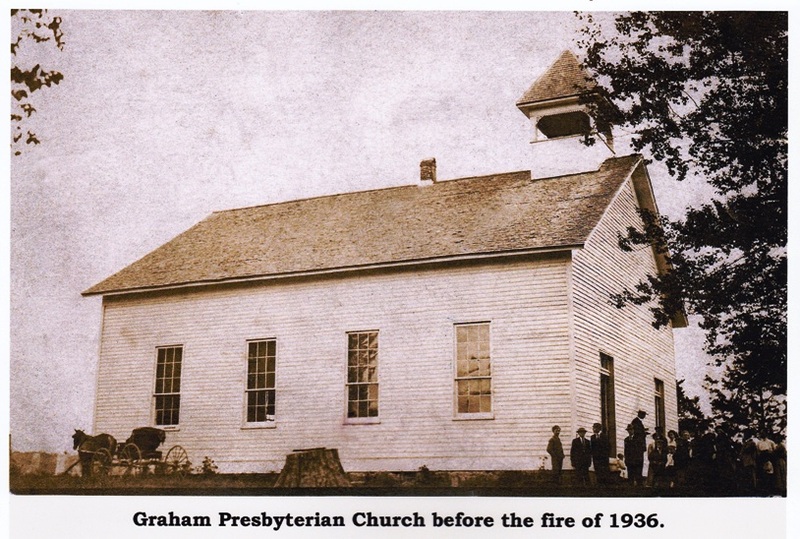 Edifice of Graham Presbyterians Burned on Eve of Anniversary. The Graham Presbyterian Church in Lovett Township was destroyed by fire at about one o'clock Saturday afternoon. Motorists on Highway 3, about one mile from the building, saw the fire and notified John and Adam Ross, who spread the word among the people of the community. The flames had gained such headway when discovered that it was impossible to save wither the building or its contents. All of the church furniture was destroyed except the communion service, which was not in the church at the time. Although the origin of the fire is unknown it is believed by many that it started from a match or cigarette tossed aside by someone passing on the road. The flames burned over the church cemetery before the fire was extinguished. Those who viewed the ruins expressed surprise at the fact that a small American flag, which marked a soldier's grave, remained untouched by the flames that destroyed grass and shrubbery of the cemetery leaving the flag standing in a charred area. The church was destroyed on the eve of the 119th anniversary of the organization and plans had been made all day meeting celebrating the event. The church building which was destroyed was built in the year 1851 during the pastorage of the Rev. Daniel Lattimore, who was a great uncle of the present pastor, the Rev. Daniel C. Simpson. 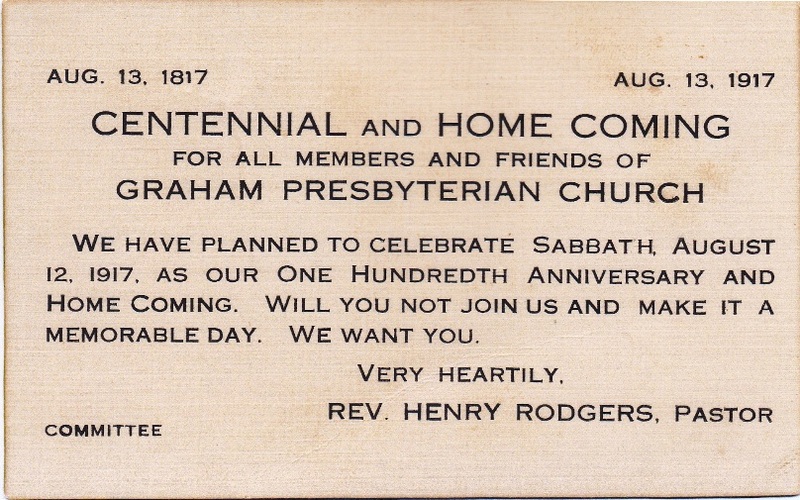 The church was organized about the time that Indiana became a state and is the oldest Presbyterian church in the county. A short time ago the Ladies Aid Society of the church, had pews and woodwork refinished. The loss was partially covered by insurance. On the Sabbath day following the fire the annual anniversary homecoming was held under the trees near the church ruins. Many churches and communities, near and distant were represented in the crowd that gathered for the event. The sermonin the morning was preached by the Rev. W.W. Logan, D.D., of Louisville, Ky., and in the afternoon the Rev. Robert Lodwick, of Scipio, brought the message. While the smoke from the ruins was still rising, the officers of the church held a meeting on the church grounds and unamimously recommended that plans be made for a new building. A meeting for further consideration of plans was held Monday evening at the home of Jas. Carson. Sunday School will be held, Sunday at the home of Mrs. Anna Graham.